WineFan at The Winery at La Grange | FTLapps, Inc.
Who doesn’t love a good ghost story? The Winery at La Grange sure does! 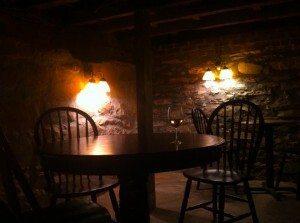 This winery has an element most wineries in this area do not: a haunted tasted room. And, according to history, the 1790s-era home was haunted long before La Grange became a winery, so it’s not just a marketing ploy made up to attract guests. Enjoying wine in such an historic setting, with the possibility of seeing or hearing a ghost, is an opportunity that must not be squandered. The most noteworthy ghost at the winery is the one of Benoni E. Harrison, a wealthy man who lived in the house in the mid-1800s. The winery has even named a wine after Benoni. To prevent strange things from happening, a glass of Benoni’s Reserve is kept on the mantle of an upstairs fireplace. There is also Benoni’s lounge downstairs. It is a dark, stone-wall cellar that is great for trading your own ghost stories while enjoying a glass of wine. To go along with these spooky stories, La Grange has wines for all kinds of wine fans. One of our favorites was the Snort, a Port-style wine. It is deep red, with fruit flavors, making it a perfect complement to any chocolate dessert. For the white wine drinkers, the ’11 and ’12 white wine blends are great for a summer day on the patio. The ’11 offers a dry blend, while the ’12 has a small amount of residual sugar to please all palettes. Non Malolactic fermentation in French oak. Crisp green apple. Citrus notes and smooth on the palette. Aged in Hungarian oak. Blend of Traminette, Vidal Blanc, and Seyval. 1.2% residual sugar. Ripe fruit flavors such as melon and apple make this wine a perfect match for a warm summer day on the patio. Lots of spice with this Merlot as well as dark fruit flavors. Well balanced tannins. Flavors of mineral and earth accompany hints of spice. Dark fruit will become more intense as the wine ages and tannins soften. Great nose on this wine. Strong tannins, vanilla and pepper flavors with blueberry fruit flavors. Blend of Merlot, Chambourcin, Cab Sauv, and Petit Verdot. Mellow tannins make this an easy drinking wine with intense red fruit flavors. Blend of Virginian Chambourcin and Californian Mouvedre and Syrah. 1.2% residual sugar. Intense dark and red fruit. Port style wine. Dark fruit and chocolate notes. Great finish. Serve with chocolate.